For me Cooking is Relaxing. For me Cooking is a Hobby. Slipping in a favorite CD to set the mood, sipping a cup of hot coffee with a spicy pizza from Dominos or a glass of red wine to boost the mood, :-) , is as important as the recipe we have planned and the ingredients in our fridge. Cooking something new, something different, something special for your someone special is a reward in itself. And the additional bonus is the admiration you get. All thanks to internet and the digital world that has made experimenting in kitchen a lot more easier and successful. You just have to type Raw Banana recipes and you'll get hundreds of them. What a big help!!! So this recipe is a mix n match of various recipes I got to see in various blogs. Over Cook Bananas can spoil the recipe. Always add a slightly Roasted Flour to make the balls.. Adding cashew nut paste to enhance the gravy taste. Wash the bananas and potatoes thoroughly with warm water . Fill a large saucepan with hot water. Heat the water on the stove top over high heat to bring it to a boil. Place the green bananas and potatoes into the boiling water. Boil the bananas for 20 minutes. Remove the bananas from the water when you can easily pierce them with a fork. Slice off the ends of the bananas. Peel the skin off of the bananas. Continue boiling the potatoes till done. De-skin. Or Else, you can pressure cook bananas till one whistle, and potatoes for two more whistles. Roast the Gram Flour over medium-low heat for 2-3 minutes. Remember you only need to remove the raw texture, not the color. Mash the boiled bananas and Potatoes along with Roasted Flour, grated Onion, Green Chili, Coriander leaves, Ginger - Garlic paste, Red Chili powder or Fresh Black Pepper powder Cumin powder and Salt. Make smooth balls out of this mixture. Whenever making vegetarian fry items, I prefer my cute little Bella Deep Fryer, as after frying vegetarian items, I can reuse the oil for many days. But this time, I used deep frying pan. No idea...why???? Deep fry the balls over medium-low heat and keep aside. Now, drain away the excess oil, and in the same oil add onion paste. Fry till translucent. Meanwhile grind Cashews to make a fine powder. Add Ginger – Garlic paste, along with the Cashew-nut powder. 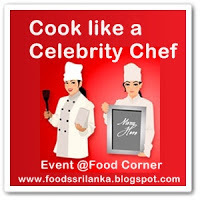 Fry for another 4-5 minutes stirring continuously so as to cook the Cashew-nut powder properly. Add Turmeric, Red Chili powder, Cumin powder and Coriander powder. Add a tablespoon of water to prevent burning of the mixture. Stir in tomato puree, cook covered for a few minutes. Add boiled water to get the desired consistency. Add Salt, cover and cook for a while. Place Banana Balls/Koftas in a shallow dish and pour hot gravy on top. Garnish with fresh coriander. Serve hot with rice or bread of your choice. This is absolutely a novel as well as an interesting recipe!! Absolutely yummy kofta curry Anshu. Welcome back to blogging world dear. Happy Valentine's Day! Super droolworthy balls, loving that gorgeous curry. Lovely curry! Have not tried raw banana in a curry dish before! I've never seen anything like this! 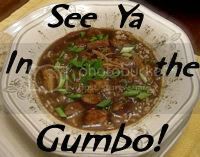 Thank you for sharing this week with See Ya in the Gumbo. I enjoyed reading about something new. both my hubby & I love raw banana dishes. I'm sure he is going to love this too. Lovely recipe, Anshu, and such clear directions! I've just started following your blog and would welcome you doing the same on my blog. Did you develop this site yourself? Please reply back as I'm attempting to create my very own site and want to know where you got this from or just what the theme is called. Cheers! We love just regular banana Sabji so I think we will love this one..
Hi! You have a nice blog with amazing clicks . I have just started following you and it would be highly encouraging if you may visit/follow me back. Banana's i love it alot. Cause from childhood i eat it alot. After my ear operation i scared to have banana but i can eat the dishes made of banana. Nice fantastic post. CLickfoodsnearme. I'd like to invite you to join the site Recipes.in where users can search through hundreds of thousands of recipes from Indian food sites and blogs. 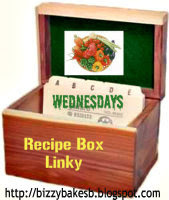 If you want to add your food blog to the list and have your recipes indexed on Recipes.in all you have to do is follow the instructions here: http://www.recipes.in/add-your-food-blog. It is yet another delicious dish to cook. The potato items are very favourite and you have added banana flavour too. The rest of the linked sites are also inspiring and lucrative Indian Recipes to serve your family members. I have never tried this. It looks delicious..Thanks for sharing..
simplest thing to be aware of. I say to you, I certainly get annoyed while people consider worries that they plainly don't know about.